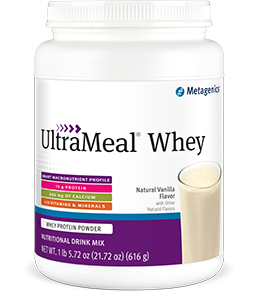 Ultra Meal Whey, is a nutritional drink mix containing whey protein, which has the highest biological value of any naturally occurring protein.15 grams of whey protein blend-isolate and pre-digested hydrolysate containing a complete amino acid profile. 4 grams of fiber; excellent source of calcium. Gluten free, non-GMO.